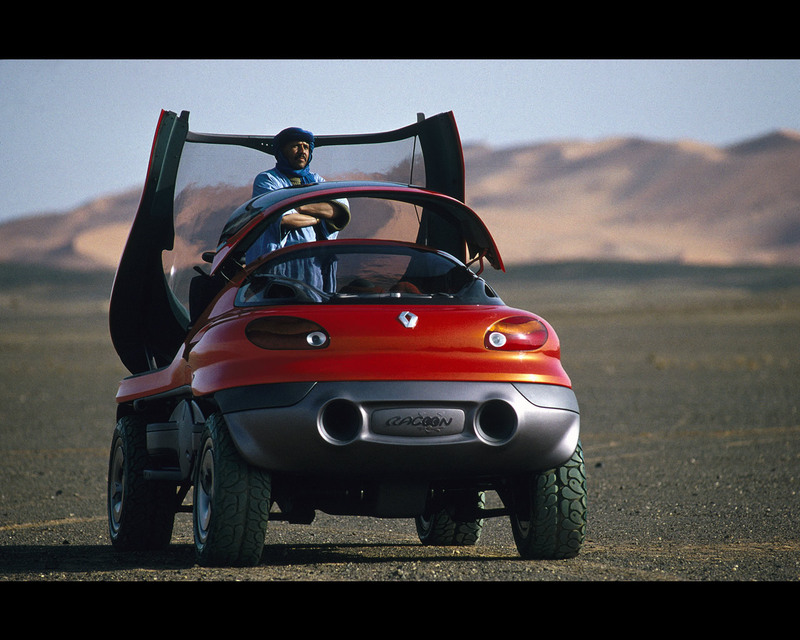 The Renault Racoon Concept made its first public appearance in 1992 in a film intended to demonstrate Renault's technological expertise in the field of computer-generated imagery. The Renault racoon Concept itself is an all-terrain, go-anywhere vehicle combining ideas and technologies. 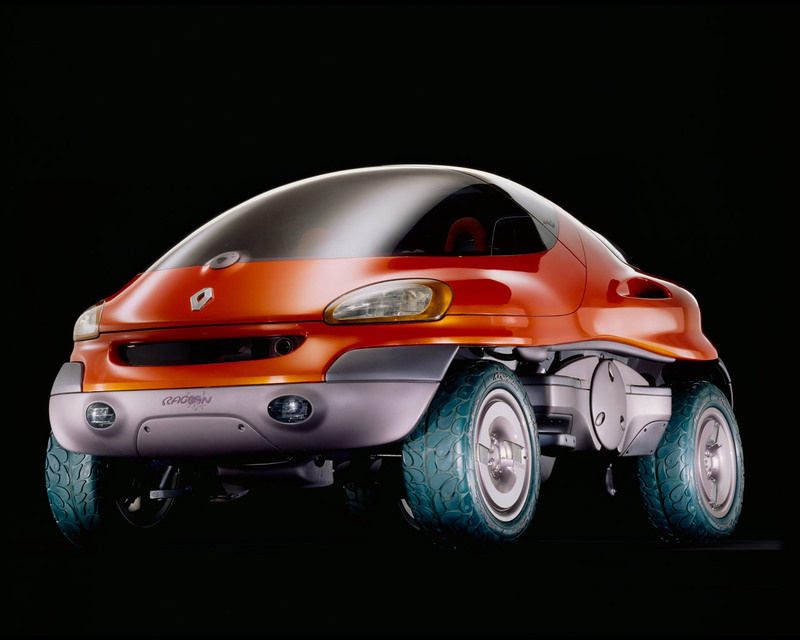 The Renault Racoon Concept is a vehicle of extremes which is always il its element wherever you take it. This Concept car is also amphibious with a top speed of 5 knots in water. Its philosophy is one of taking its occupants right to the very heart of their environment. the extra-high and extendable ground clearance, over-sized green wheels, long arms and buldging canopy give the vehicle an unusual appearance. With forms that are round and flowing, the Renault Racoon Concept has three distinct sides to its character. First, a hybrid, helicopter-like look with a high glass cockpit underlines its observation and discovery functions. 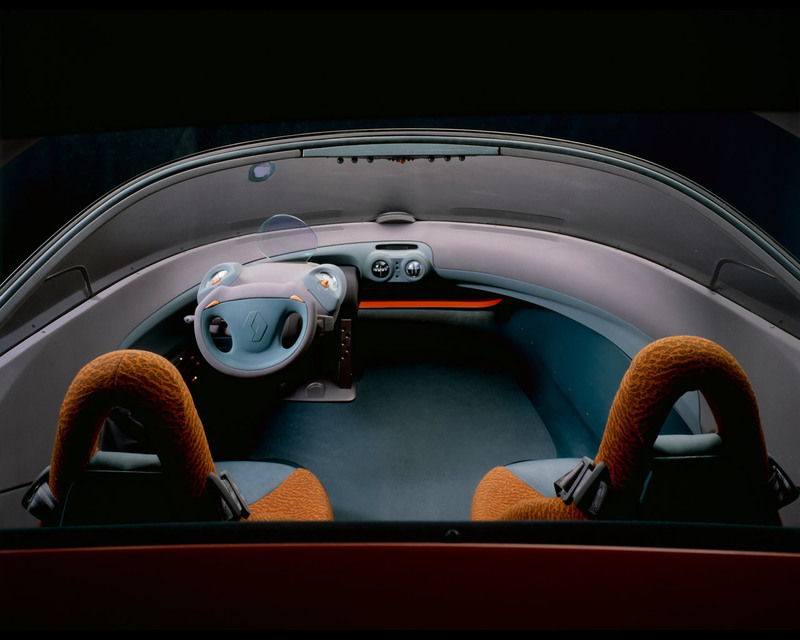 Second, Renault Racoon Concept seats its occupants almost horizontally like in a sports car. And third, it flexes its mechanical arms like a powerful construction vehicle. Features: cabin accessed by remote-controlled pivoting canopies. Three seats laid out in triangular configuration with seat-mounted safety harnesses. Rear and lateral cameras for rear view vision (with infrared assistance for night use). Keyboadrless PC, hand-free telephone and satellite communication system. Chemically treated glass, featuring ultrasound system which desintegrates water molecule on contact. Racoon splits into two, easily separating into its high-tensile steel chassis on the one hand and its all steel bodywork on the other. 3.0 litre twin turbo V6 engine coupled with 6-speed gearbox and three torque transfer differentials offer peerless traction on muddy tracks and an off-road top speed of 150 kph. Two hydrojets driven by the engine provide propulsion in water.